China has protested previous navigation operations in the sea, saying the United States is meddling in an Asian conflict. A Chinese warship sailed within 45 yards of a Navy destroyer in the South China Sea on Sunday in what American authorities described as an “unsafe and unprofessional maneuver." 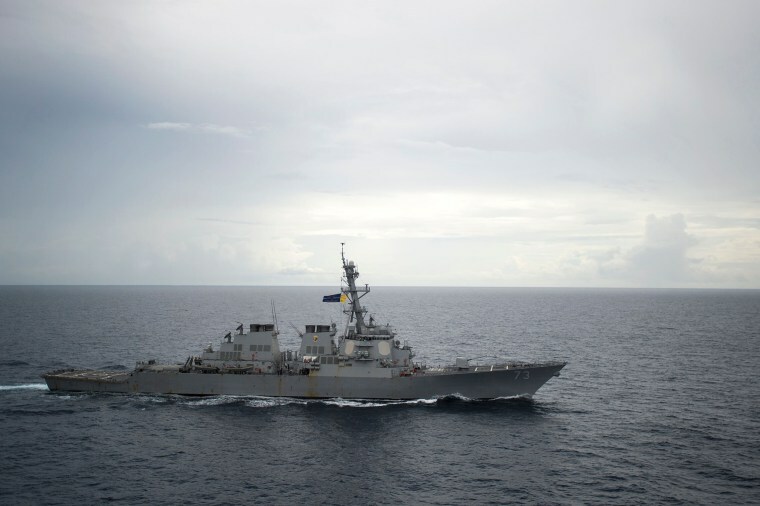 U.S. Pacific Fleet spokesman Charlie Brown said the Luyang destroyer “conducted a series of increasingly aggressive” moves before it approached the USS Decatur’s bow. The American ship changed course to prevent a collision, Brown said. The incident occurred amid growing tensions over tariffs and sanctions — and as the Decatur conducted a "freedom of navigation operation" in the disputed, strategic waterway, a Defense Department official told NBC News. China, which claims most of the sea as its own, has reportedly militarized three of the Spratly Islands with anti-cruise ship and surface-to-air missile systems, CNBC reported. The Decatur was nearly 14 miles from two reefs the archipelago when Luyang approached it. The Philippines, Vietnam, Malaysia, Taiwan and Brunei also have territorial claims to the islands. In November, during a visit to one of China’s loudest critics in the dispute, Vietnam, President Donald Trump offered to help resolve the conflict.